We are glad to present a new course organized from an Italian language school in Tuscany, at the seaside: Giacomo Puccini Centre in Viareggio. The Giacomo Puccini Centre is a an Italian Language school recognized by the Italian Ministry of Education. The centre is located 500 meters from the beach in Viareggio (Tuscany), well-known city for its Carnival celebration. Viareggio Carnival is 135 years old and is doubtless the most famous carnivalesque event in Italy (together with Venice Carnival) and one of the most important of Europe, recalling hundreds of thousand visitors from all over the world. Viareggio Carnival was born in 1873 as a folk event, and at present attracts to itself the attention of big Italian and international medias, besides a large audience composed of people of every age and social level. Carnival will be celebrated every year for almost a month in January/ February . In this period, on special course starting dates, Giacomo Puccini Centre offers a Carnival course: the Carnival week consists of a 2 week Standard Course and of special cultural classes and visits. Students will not only learn the Italian language, but also understand and enjoy this unique celebration. Besides morning classes they will take part to the sfilate (parades): every Sunday afternoon huge floats, masquerades, folkloristic bands and performers from all over the world will parade on the Passeggiata (Viareggio long promenade along the beach). The biggest floats are about 20 meters high, 14 meters wide weighing about 40 tons each; they carry about 200 people in costume, who will dance and throw confetti and candies. Other people will be inside the floats to manoeuvre the weights, the counter-weights and levers that will make the puppets move. The paper maché puppets satirise public and political figures, put on scene, social issues, as well as the fairy-tales’ heroes. The Carristi, teams of special workers and craftsmen supposed to build Carnival floats will start about 8-6 months in advance to create them: the best one will be awarded a price and the competition among them is very hard! 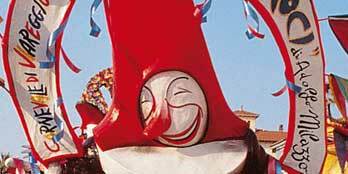 The Cittadella del Carnevale is the Carnival town and museum, where floats are build and kept. Attending the Carnival week students will also have the chance to visit this town and see the floats in the hangars: special guides will explain them the Carnival history and the craftsmen’s work. During the Carnival weeks Viareggio offers a programme of related events including a large number of shows and cultural events such as fun musical comedies in vernacular (for example the Canzonetta), that will be interesting for students for its special popular Italian language and accent. All discos and pubs will organize Carnival parties, that students will enjoy during the whole period. In particular they can take part to the Rioni. Rione means city quarter, but also indicates the festival celebrated each Saturday evening and night in a different city district: masquerades and all-aged people in funny and original costumes will enjoy the tipical Viareggio food (fried fish, tordelli, fish rice… red wine…) and dance on the streets or on smaller floats celebrating life, joy and dance. “A Carnevale ogni scherzo vale!”: joking and laughing are the rules during Carnival in Viareggio. The biggest and most famous festival is in the Rione Darsena in the Viareggio harbour quarter. The Viareggini (the people from Viareggio) are very proud of their Carnival: sewing and creating self-made original costumes is really a rite! 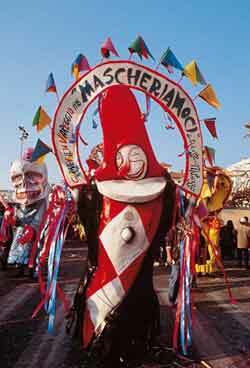 Carnival will be closed on Martedì Grasso (Mardi Gras) with fireworks and an evening parade on the Passeggiata. The Carnival Week is a study and leisure chance that should not be missed! The course will be from February 04 to February 15 in Viareggio. A new Course for 2013: Italian Tour!